We didn’t focus as strictly on historic sites in New York as we did in Boston, but we did manage to do a little heritage touring on our last day in the Big Apple. We made a point of visiting Federal Hall National Memorial on Wall Street, site of the nation’s first Capitol and George Washington’s first inauguration. 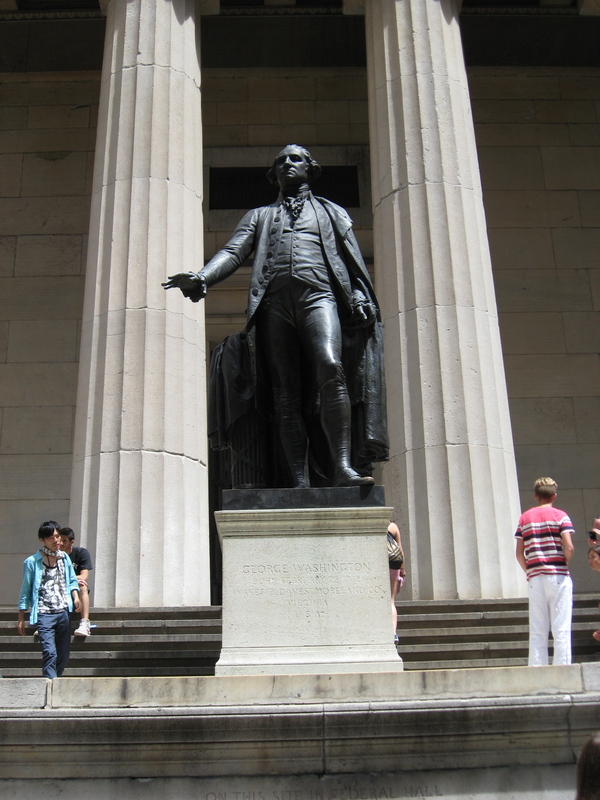 The original building is gone, but today an impressive classical structure and a statue of Washington mark the spot. 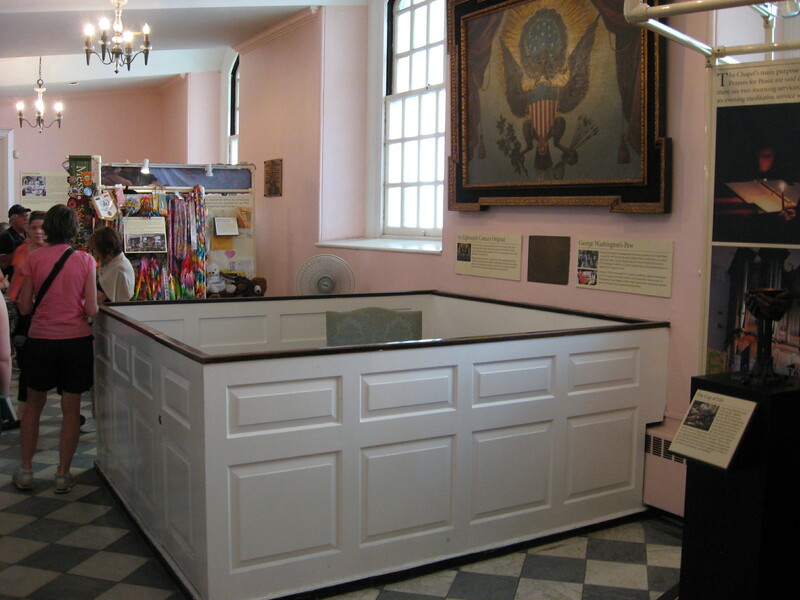 Inside the building is an exhibit on the trial of colonial printer John Peter Zenger, arrested for publishing articles critical of New York’s royal governor. 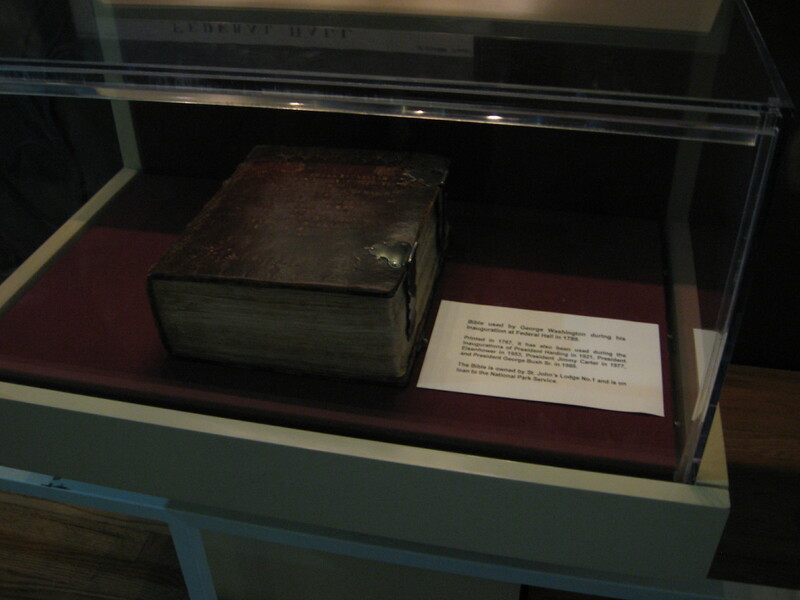 Zenger’s 1735 trial for seditious libel in the original Federal Hall—at that time it was New York’s City Hall—proved to be a landmark case in the history of freedom of the press. His lawyer argued that demonstrably factual statements cannot be considered libelous, the jury agreed, and Zenger walked away a free man. 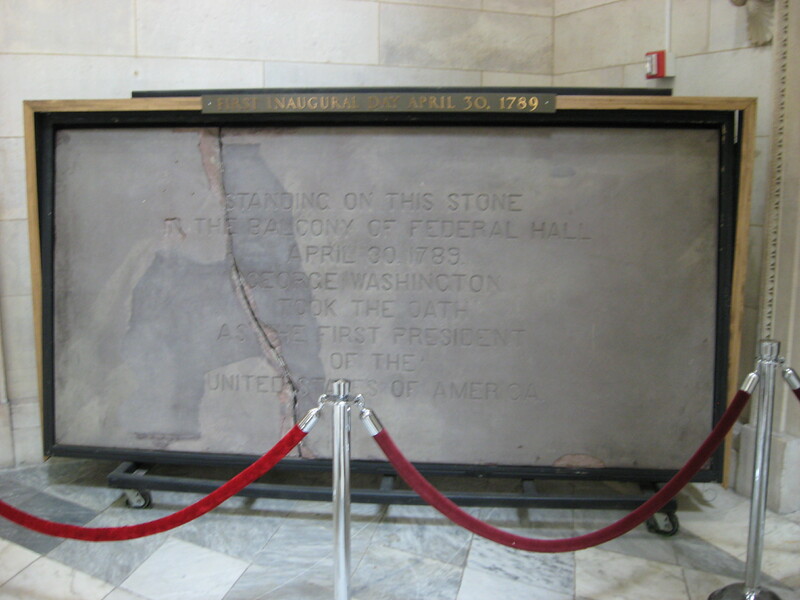 …and the stone on which he stood while taking the oath of office. After the inaugural ceremony, Washington attended a service at nearby St. Paul’s Chapel. He continued to worship there while the capital remained in New York, and you can still see his pew, right underneath an oil painting of the Great Seal of the U.S.
On the east side of the church is a memorial to Gen. Richard Montgomery, killed while leading the attack on Quebec at the end of 1775. 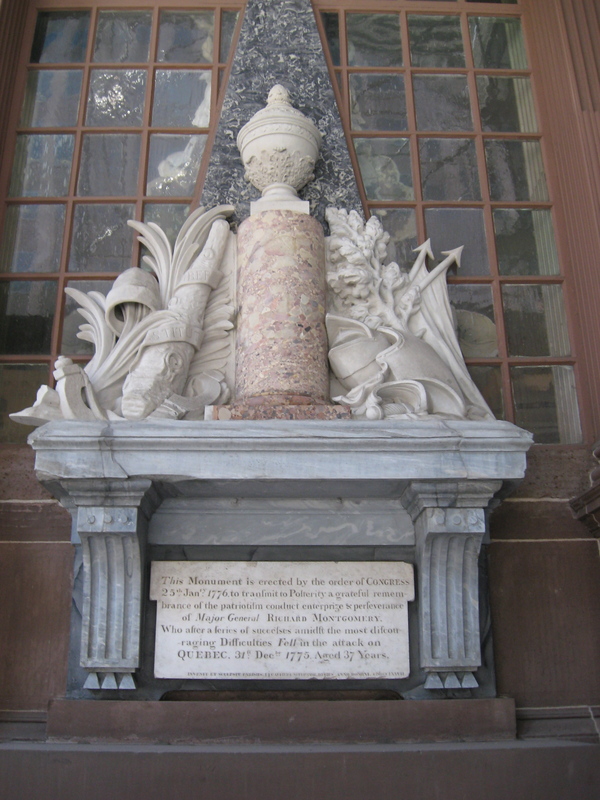 Montgomery’s remains were moved to St. Paul’s with a great deal of fanfare in 1818. Unlike its mother church, St. Paul’s Chapel made it through the great New York fire of ’76 and is now the oldest church building in the city. In fact, surviving catastrophes has been something of a hallmark of St. Paul’s. It’s right next to the World Trade Center site, but miraculously came through the 9/11 attacks without any major damage. Visitors left thousands of stuffed animals, flowers, cards, and other memorials around the church after the attacks, and some of these mementoes are on exhibit inside the sanctuary. (You can see a few of them in the photo of Washington’s pew.) Emergency personnel working at the WTC site stayed at St. Paul’s during the recovery effort. And the building is still there, a dozen years after that awful September morning and more than two centuries since Washington stepped inside on the very day American government opened for business.